(1964) "Love Potion Number Nine"
"Love Potion No. 9" is a song written in 1959 by Jerry Leiber and Mike Stoller. It was originally performed by the Clovers, who took it to number 23 on the US as well as R&B charts that year. 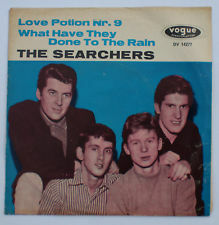 The song was recorded by The Searchers in 1964. Their version reached number three on the U.S. Billboard Hot 100 and number two on Cash Box during the winter of 1965. Herb Alpert and The Tijuana Brass did an instrumental version (side 2, track 1) on his 1965 album Whipped Cream and Other Delights. The Coasters released a version in December 1971 with "D. W. Washburn" on the B side. It reached #76 in the Billboard Pop Chart and #96 in the Cash Box Pop Chart. The song describes a man seeking help to find love, so he talks to a gypsy who determines, by means of palmistry, that he needs "love potion number 9". The potion, an aphrodisiac, causes him to fall in love with everything he sees, kissing whatever is in front of him, eventually kissing a policeman on the street-corner, who breaks his bottle of love potion. I wonder what'll happen with Love Potion Number Ten? The narrator describes himself as being "a flop with chicks ... since 1956"; later recordings of the song have often changed the year to suit the year of recording or the age of the performer. An exception is the Australian alternative rock band Tlot Tlot's recording, which leaves the year in the song as 1956. It also uses the alternative Love Potion No. 10 lyrics. The song was the basic premise of the 1992 film Love Potion No. 9 (film) starring Sandra Bullock and Tate Donovan. ^ a b Gilliland, John (1969). "Show 14 - Big Rock Candy Mountain: Rock 'n' roll in the late fifties. [Part 4] : UNT Digital Library" (audio). Pop Chronicles. Digital.library.unt.edu. Retrieved 2011-04-30. ^ The Clovers' charting singles Retrieved February 7, 2012. ^ Whitburn, Joel (2004). Top R&B/Hip-Hop Singles: 1942-2004. Record Research. p. 124. ^ "Cash Box Top 100 1/23/65". tropicalglen.com. Retrieved 23 August 2018. ^ "Musicline.de – The Searchers Single-Chartverfolgung" (in German). Media Control Charts. PhonoNet GmbH. Retrieved June 10, 2018. ^ "The Searchers Chart History (Hot 100)". Billboard. Retrieved June 10, 2018. "Don't You Know I Love You"